I want to start out first by saying that I am in no way trained or certified in sleep training babies...maybe I'm just lucky...but my babies are good sleepers! Before I had my first baby I had heard about the dreaded sleeping of a newborn. I was in no way prepared, who can be? At the same time I had this brand new angel sent from above, and I thought to myself, nothing this baby does will ever make me mad, sad or upset, he was perfect! Fast forward six weeks, my baby was now sleeping 4-5 hour stretches and people were telling me I was the luckiest. Seems how this was my first, I didn't know any different. However I wasn't really tired and I felt like I was kind of getting the hang of things. This continued for another month or so, and by around 3 months he was making it from 8:00pm to 4am. This 8 hour stretch continued till 5 months, then I was done waking up at 4am. I started researching Sleep Training tips and methods and came across "Baby Wise." I bought the book and literally read it in a day or two. It was fascinating! The biggest thing I noticed that I was not already doing was the "cycle." The Baby Wise cycle is as follows, Sleep, eat, wake, sleep, eat, wake. I was so confused, why would I feed my baby when he wakes up? Don't I want to feed him right before he goes to bed so he sleeps longer? Apparently not! I started the training the next day. I will be the first to tell you, it wasn't easy. Especially because my baby was so set in his ways. He had been use to this schedule for the past 2-3 months. This method does require the CIO (cry it out) theory which some people are not fans of. I didn't know how I would deal with it, the first night he cried for 2 hours. Every 15 minutes I go in, put his binki back in, (not part of Baby Wise, but it worked for me) told him I loved him, and walked out. It was hard, harder for my husband, but we made it through night one! Night two was an hour, night three 45 min, night four 20 min, and then for the next 2 weeks he woke up every morning at 4, I gave him his binki and he slept till 8. Then miraculously, one day I heard him talking in his bed, I checked my phone and it was 7:58! At the time two weeks probably felt like an eternity, but nothing beats a sleeping baby! On top of that he was napping like a CHAMP, two hours uninterrupted! The "cycle" also helps with their nap schedule. Baby Wise also claims that if you train the baby at a young age they will continue to have great sleep habits throughout their childhood...TRUTH! Seriously, my kids are amazing sleepers. Another favorite thing about the book, as the child gets older they have an actual outline of the schedule your baby should be following. I still find myself bringing the book back out and recapping what I should be doing. Even better...with my second baby it was like I didn't even need to train him, I think because I had it engrained in my system sleep, eat, wake. I was already doing it without even realizing it. 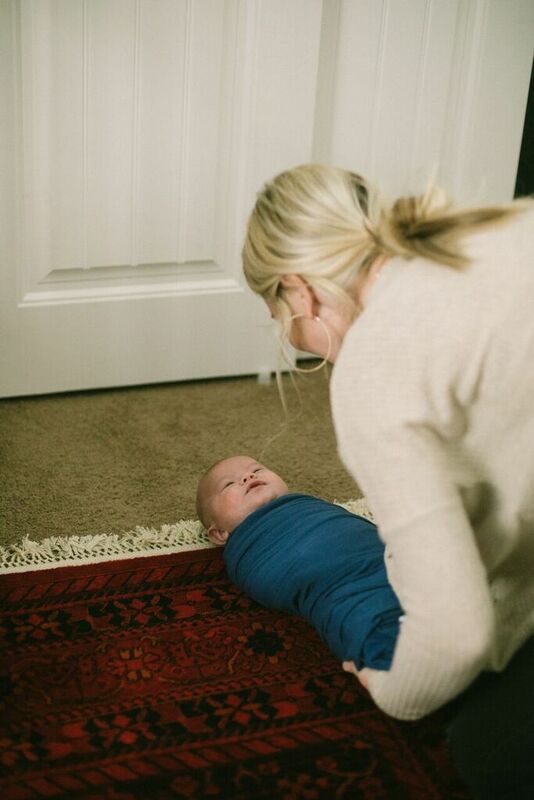 I have swaddled my babies from birth till around 6 months, or when I can tell they want to be unswaddled. I always have a sound machine going when they sleep. Even if my babies are upset, if I turn on a sound machine they tend to calm down. I keep my babies in my room until they are about 3 months old. I then move them into their own room, I think this is so important not only for baby, but especially for mom and dad! I completely understand that sleep training is not for everyone. I am a better mom when I get my sleep, and my babies are happier when they get their sleep! So this works for me!